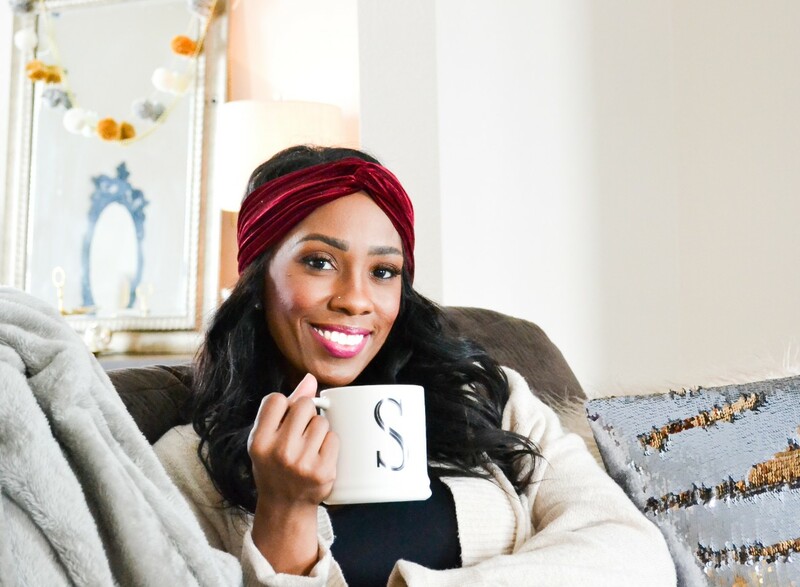 3 PRODUCTS UNDER $10 YOU NEED!! Let's talk about a few affordable makeup products I've been using and highly recommend! I love my high end products but I also love to have affordable options. 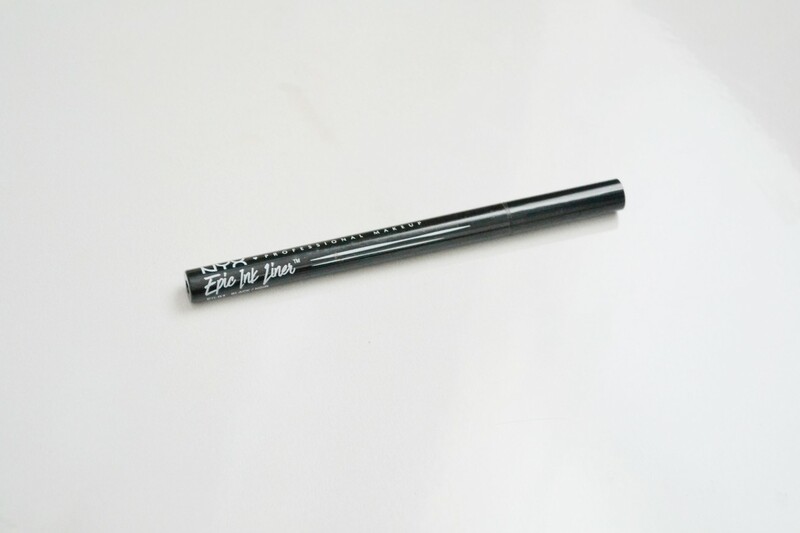 Ok so the first product is the NYX Epic Ink Liner in Black. I really love the NYX brand! They have great products and the price is great. 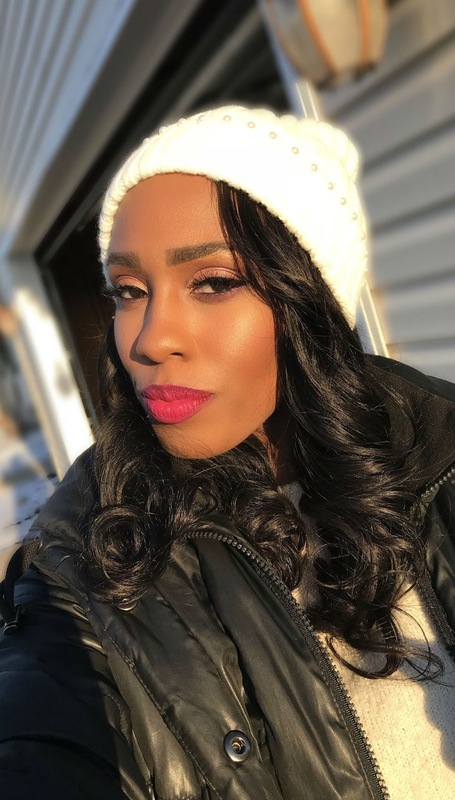 You can see where I raved about one of my fave lipsticks from NYX HERE. So I've been looking for an affordable eyeliner for awhile now and each one I would try would either dry out after only a short period of time, was hard to apply or the color wasn't very intense. I saw this NYX liner one day while I was in Target and decided to give it a try. I've been very happy with this liner and highly recommend it! The liner looks like a fine felt tip marker, glides on smooth and is really easy to handle. I love to use this on the days I'm doing a winged liner look. I often reach for it even if I'm not doing a winged look. The color is super intense and stays put. The only downside is that it can be a bit hard to just wipe off, so if you make a mistake it can be hard to correct. I just apply it lightly before going in with a heavy hand. 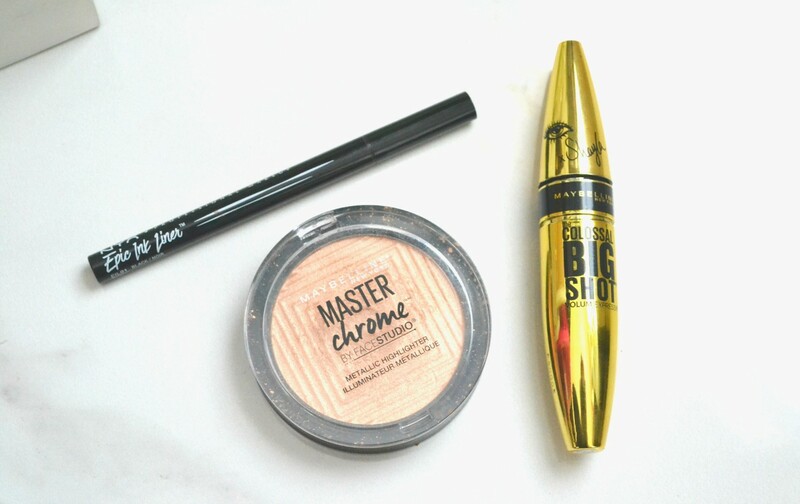 Next up is the Maybelline Master Chrome Metallic Highlighter in Molten Gold-100. Like most of the beauty community right now, I love a good highlight and I probably own way too many. I mean how many highlighters does one need??? All of them, ha!!!! But seriously, I love this highlighter, I'm so glad I decided to give it a go. I've been using it everyday for well over a month and I still love it. It's very pigmented so a little goes a long way. I would suggest using a light hand to start off application and building up depending on the look you're going for. This is definitely one of the best drugstore highlighters I've tried. 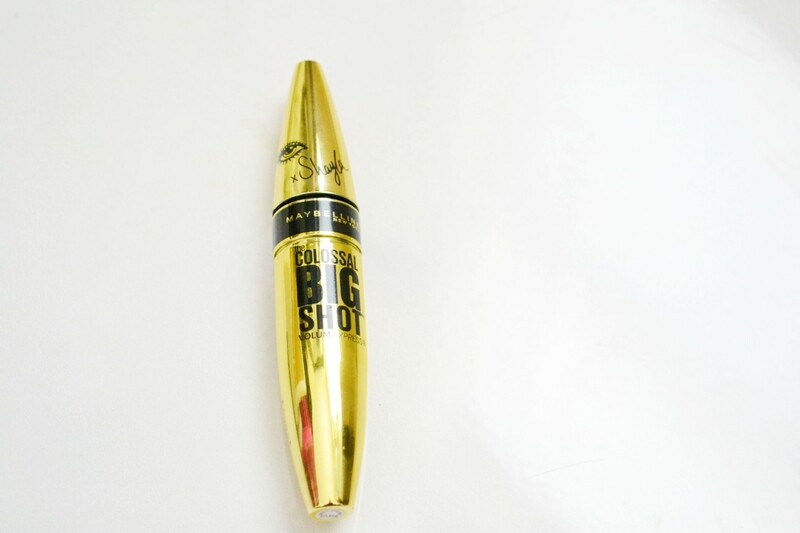 And finally, the Maybelline Volum' Express, Colossal Big Shot mascara. Ok so if you can't tell, one of my favorite go to drugstore brands is Maybelline. You can see HERE where I talked about their Vivid Matte Lip line, which I love. This particular mascara shown is the Maybelline x Shayla edition but I do believe it is part of the regular line of mascaras they offer. Now, I will admit I am not a mascara connoisseur by any means. My lashes are so curly and grow in different directions so it can be hard to deal with them. I typically use one coat of mascara and put on a pair of lashes. However, when I use this mascara without falsies my lashes do look longer and more voluminous. Since I typically where false lashes everyday, I apply one coat of this to my own lashes, apply the falsies, then I add another coat of mascara on top so they not only blend together, but appear a bit thicker. I've been using all of these products almost daily for over a month now and I highly recommend them. Even if you're not in the market for any of these products I suggest you try them, I'm sure you'll love them as much as I do. I liiiivvveee for a good mascara lol. I've never tried this one by Maybelline out. I may have to pick it up when I go to target today! If you do, let me know what you think about it! I use nyx also and I love that brand. You really looked out with this blog post. Yesss!! Glad you enjoyed it! I know me too! It's nice to have an affordable option when I want something new but don't want to spend the money! Yay! I know you'll like it! Work it Girl! Life is 1000000x's better with a good highlishter. Ooh I'll have to check those out, I haven't tried anything from Colourpop yet!! Love and live by that Mascara. I'll be sure to check out Face Studio products. I've always stuck to Mac highlighters thanks for the recommendation. 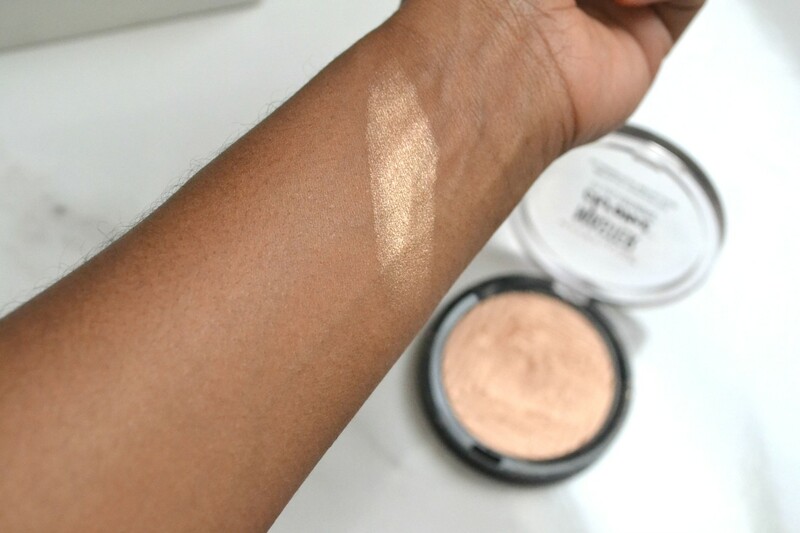 I love MAC highlighters too, but definitely give the Maybelline Chrome highlighter a try, it's a great product! I pretty much love anything from NYX! Me too, they are a great brand! Ugh, I love hearing about affordable beauty products. It's funny, I actually own that NYX eyeliner (got it in a goodie bag), yet I never used it. Might have to try that and the Master Chrome highlighter ASAP! lol! Try it, I'm sure you'll love it! I definitely need to check out these products. I love having simple products to put on when I'm just heading out for a second or just want to look natural for the day. Yep these products are good for creating a nice natural look as well! I have the MAster Chrome highlighter and it's EVERYTHING!!! Thanks for sharing this! I think I’m going to buy the Master Chrome highlight; the swatch itself is bomb! If you do, let me know how you like it!! 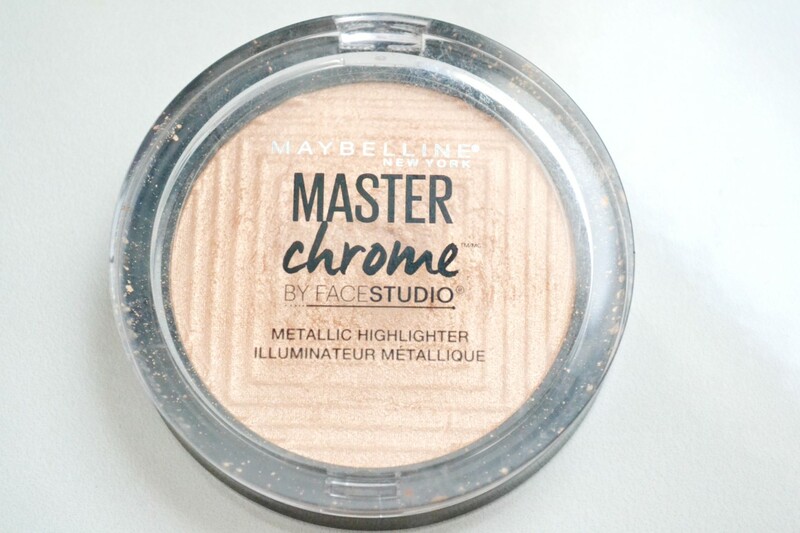 I'm now convinced that I HAVE to get the Maybelline Master Chrome highlight! It's so gorgeous from the swatch and on you! It's very pigmented, even I was surprised at first! I'm always looking for a good highlighter and eyeliner. Will definitely try these.